It’s the first week of December and so starts a series of holiday concerts at The Music Center at Strathmore. 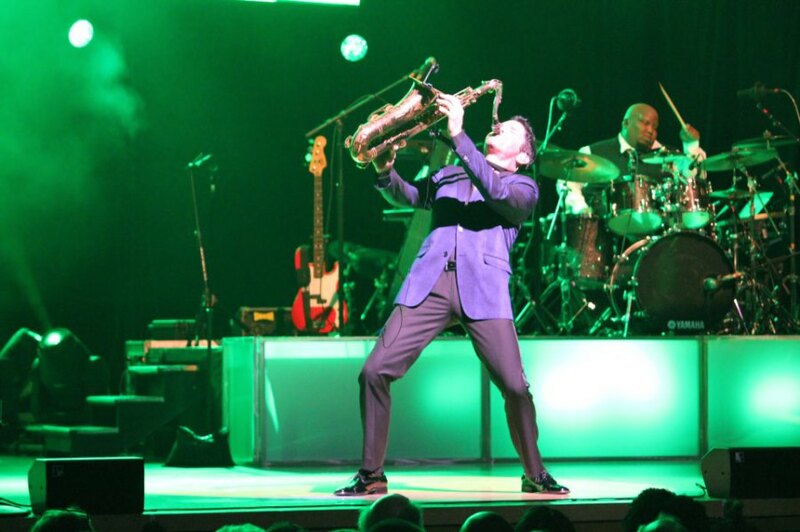 If there wasn’t a better concert than the Dave Koz and Friends Christmas Tour 2012 to kick off the series I don’t know what was.If you don’t have holiday spirit after leaving this event you need to check your pulse. This concert was like a shot of peppermint yuletide cheer. The perfect antidote for those (myself included) who might need a little reminder to get busy Christmas is only three weeks away. First of all let me applaud the showmanship of Dave Koz. He was engaging, entertaining and fun. I could tell he really loves performing. His rendition of Winter Wonderland was pleasant and smooth. His notes accentuate perfect tone and harmony. Dave Koz has a knack for opening songs with cool calm saxophone solos before picking up the tempo and really livening things up. He doesn’t by any means play boring music. Other than Dave Koz were his friends. These weren’t just any ordinary friends. They were the likes of Sheila E., David Benoit, Javier Colon, and Margo Rey. Each of which bought their own style and artistic flare. Sheila E. especially, she had a set of timbales at the front of the stage with a microphone and would simultaneously sing and play drums. That takes talent. Sheila E. has been performing since she was five years old and still was as enthusiastic as I ever seen anybody perform. She really loves to play the drums, playing the drums is in her soul. I have never seen the drums played like that before and in nine inch heels. Steady breaks followed by a succession of crashes and fierce rolls. Absolutely spectacular! The mix between Dave Koz’s saxophone, Sheila E’s timbales, and David Benoit’s piano sounded great together, meshed well and was incredibly dynamic. David Benoit was another outstanding performer. He played some incredibly tough piano solos like it was nothing. It was a breeze to him like second nature. His performance of A Charlie Brown Christmas was highly enjoyable. All throughout David Benoit’s piano playing is what really made this concert special. Yet another fantastic performance was done by Javier Colon. He performed a solo acoustic rendition of “Halleluiah” and it really made a statement. He sings so prominently and with definition hitting high notes loudly before cascading down in a pure tenor tone. He really reminded me of Ben Harper. Another solo vocalist was Margo Rey who sung soft and sweet and could really draw you in before carrying you off with subtle tonal peaks. She really was great and I could see her performing musicals. She has the sound for it. This was hands down an amazing show. It had everything. Comedy, drum solos galore, duo’s, trio’s everything you could possibly want in a concert. There were so many instances of pure enjoyment. I really had fun. Whenever you have an all star list of performers like this it is surely not to be missed. It’s pure holiday enjoyment. Concerts Dave Koz Dave Koz and Friends Christmas Tour 2012 David Benoit Javier Colon Margo Rey Music Center at Strathmore North Bethesda MD Sheila E.